The following is a guest post from Anna Nym, someone we hope will be submitting many more. Recently, Senate Bill 161 passed the Senate, stating that all Delaware Public schools may not start until after Labor Day. Now, I am not against when school starts, I would be perfectly fine with school being out from Memorial Day until Labor Day, however, with this bill arises several issues. I understand the tourism, i.e. Beach traffic, in the summer that affects Cape Henlopen and Indian River School Districts, But, what about the rest of the state? Since this bill says the whole state cannot start until after Labor Day, did the sponsors take into consideration how much longer schools will have to go in the summer? Why did they stop there? Why not just mandate school must be out from Memorial Day to Labor Day? The issue here is local control. Why do we elect school board members? I mean, if a State Senator can’t even get his school board, in his district, to change the district calendar, is there even a point to having them? Did he even approach the board? Too many questions. I do not believe in allowing bigger governments to make all the decisions. Does a Representative from Georgetown know what is best for the kids in Wilmington and vice versa. What do we do then? We as parents and tax payers need to make our voices heard to our school boards, principals and teachers. We need to take an active role in our education system. We cannot continue to let the State and Federal governments decide what our children need. The decisions are based on budgets and numbers, when they should be based on what children in each district need. The moment the State and Federal government economize the education system, is the day our children’s futures die. 7 Comments on "Guest Post From Anna Nym"
I mean, if a State Senator can’t even get his school board, in his district, to change the district calendar, is there even a point to having them? Did he even approach the board? Too many questions. The Indian River School District, which is in the Senator’s District, doesn’t start until after Labor Day. Instead of questioning in a blog article whether or not Senator Hocker discussed this with his local school board, you could have simply called Senator Hocker to get the actual answer before you spewed your inaccurate garbage. 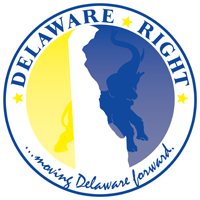 Senator Hocker is a respected, right wing, Republican, conservative Senator, he deserves more respect than this, especially on a blog that professes to be “Delaware Right.” What does this article “Move Forward” other than inaccurate fodder for liberals to use against a good Conservative? BTW, did you even research this issue? First, there was a bi-partisan task force convened to study this idea, the task force included legislators, school board members and school officials from across the state, teachers, state and local tourism officials, and seasonal business owners. The task force recommended this bill. Next. Maryland already has this law. The Maryland Comptroller estimates this practice generates an additional $4 million a year for state and local governments. And if you don’t think the state and federal governments have already “economized the education system” you’re just not paying attention. Have you heard of “Common Core” and who profits from it? A swing and a miss on your first article. The post-Labor Day start doesn’t have anything to do with traffic. It is so the kids can keep working their summer jobs until the prime tourist season is over. The resort areas employ teenagers from all over the state. Even way up here in remote arctic New Castle County, the biggest score is getting a beach job for the summer. And it’s not just the resorts, but all kinds of seasonal employment such as lifeguards at pools and so on. This bill is good for business, good for the kids, and is not the end of freedom as we know it. The closing date can’t be specified because of the unpredictability of snow days, etc. The only thing missing from this piece is being called “Yon Reader” and other utterly fake folksy affectations. Well big Government is certainly disagreeable but I wouldn’t consider this to be deplorable over reach, but instead a return to common sense, as in the way it used to be. Little Chillins, and I had my share. don’t do well in late August classrooms as their tiny head’s is elsewhere. In the case of older teens their heads is definitely elsewhere since many didn’t spend the summer reading Harry Potter and doing Math Puzzles. Lets make everyone happy, Labor Day is to reflect on Labor which is impossible if you have never worked or don’t have the inclination. Let the teens keep their jobs through Labor Day and those who avoided the concept be picked up by their respective school buses and transported to work projects the final two weeks of August. With Delaware’s budget shortfalls, unpaid labor from thousands of students could prove a character enhancing blessing to underfunded State Agencies. Well Kurt, this is not about the date, it’s about the mandate. And the argument about making a difference in employment is thin, we are talking about four days in most cases. And I wonder how much the study cost the state to come up with this? And I wonder how much the study cost the state to come up with this? Task Forces don’t pay members, the members attend because they have a stake in the process, like the seasonal business owners who were in this task force. The biggest cost would be State employee travel from their offices to the meeting room, which would be in State cars, and printing out the meeting materials on State equipment. The only other cost would be coffee, but those meeting rooms are already stocked. And the argument about making a difference in employment is thin, we are talking about four days in most cases. Have you ever been to Funland? Who do you think works there?